Fiber laser engraving, marking, or etching is a permanent marking process which engraves with slight depth into the surface of the target substrate. This process leaves a semi-contrast mark that will not fade or wear over time. 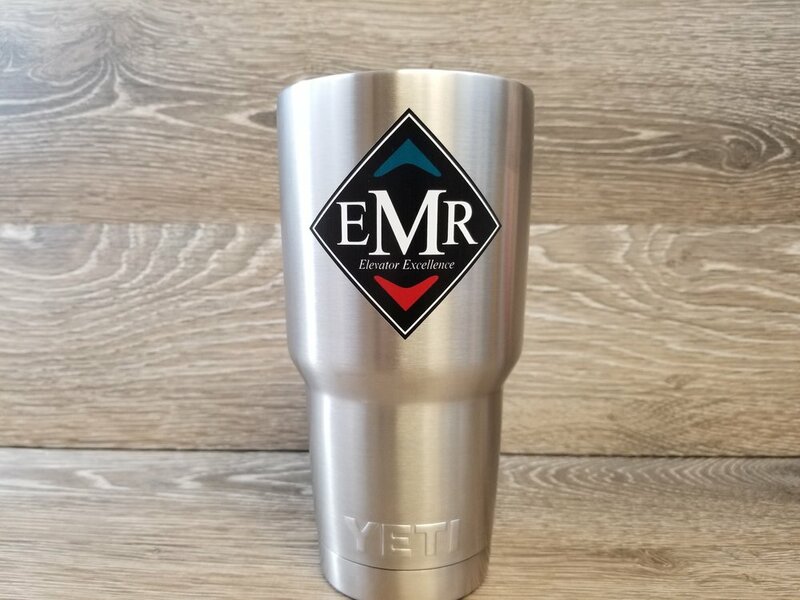 Fiber laser engraving can be performed on virtually all material types including stainless steel, carbon steel, alloys, aluminum, plastics, ceramics, wood, glass, and more. CO2 laser engraving, marking, or etching is a semi-permanent marking process which engraves without damaging the surface of the target substrate. This process leaves a high-contrast mark that may fade slightly with time or wear. CO2 laser engraving can be performed on virtually all material types including stainless steel, carbon steel, alloys, aluminum, plastics, ceramics, wood, glass, and more. Our direct to substrate printers feature the ability to print full color digital images directly onto a variety of surfaces including: metal, plastic, paper, glass, fabric, wood, stone, vinyl, ceramic, and more! Direct Printing utilizes UV cured ink to create crisp, clear, durable imprints on almost any item. Print your design, logo, text, or image in stunning full color. More colors than vinyl, more durable and versatile than a sticker, direct print is the answer. Laser Cutting is a process in which a high-powered laser is focused and controlled by a computer to cut thorugh various materials with high precision and faster speeds, leaving a cleaner edge than many other cutting methods. Whether you need high volume or small prototype runs, Engrave It Houston is equipped to laser cut jobs of all sizes. Precision cutting, speed, versatility, and quick turnaround make this process the perfect solution for many industrial application, from architectural models to manufacturing companies. Our laser allows us to cut a variety of materials including cork, wood, acrylic, plastic, leather, synthetic & natural fabrics, paper & other organic materials, stainless steel, aluminum, copper, and more for an array of different projects and needs including custom signage, gaskets, die cut prototypes, architectural models, inlays, templates & stencils, labels & tags, and more. Photo anodized aluminum combines extreme durability in harsh environments with a high quality, long lasting appearance.Variety of thicknesses and finishes, 20+ year life. Resistant to chemicals, abrasion, heat, UV, outdoor weathering.This stuff is TOUGH! 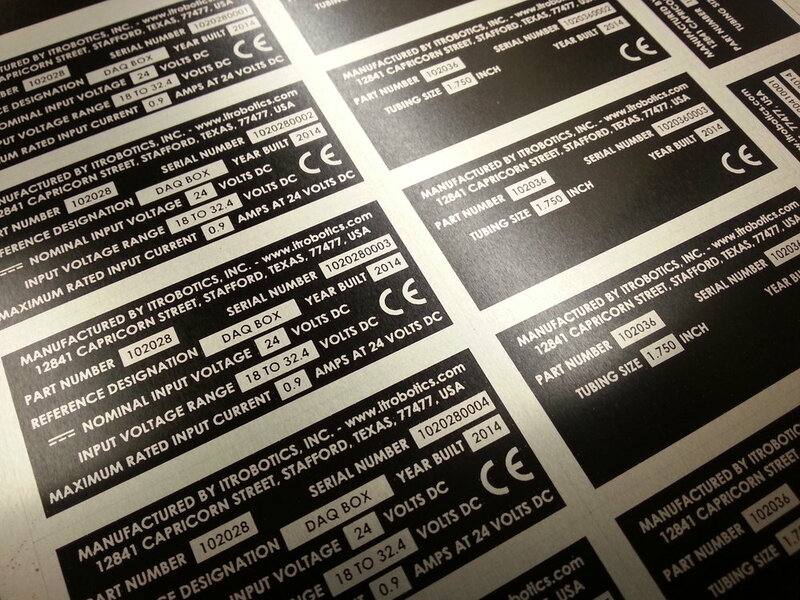 For over 50 years, industrial and military engineers have specified Metalphoto photosensitive anodized aluminum for durable nameplates, barcode labels, service schematics and control panels installed in harsh operating environments. Metalphoto’s proprietary technology permanently seals a UV-stable image inside anodized aluminum, offering the confidence of unparalleled durability, image resolution and readability. Durability – Made from photosensitive anodized aluminum, Metalphoto tags resist fading, abrasion and corrosion caused by exposure to UV light, salt, weather, industrial cleaners and chemical fluids. They’re moisture and stain resistant, and easy to clean. Cost-effective – Metalphoto is economical. On average, it costs about 30 percent less than etched and filled stainless steel. Efficient – Production time is shorter - in many cases you’ll have your Metalphoto tags and labels much faster than etched and filled stainless steel. Versatile – Metalphoto tags and labels are available in a variety of thicknesses and finishes. They can easily be customized for individual applications. Guaranteed – Metalphoto tags are certified for 20-plus years in outdoor applications. They have received military and STANAG certification for a variety of uses. Ask us for specifications. Always Readable - Photographic images afford extreme detail and contrast at any size. Meets a wide array of commercial, government and military specifications. Earned more top scores than any other barcode label material tested by the U.S.Navy (NSWC, Corona Division, IUID Center; August 2011). Notable certifications include: MIL-STD-130N, STANAG 2290, GGP-455B, MIL-DTL-15024F, MIL-P-19834B and A-A-50271 (several others listed on metalphoto.com).